Place and Date: At Winchester, Va., 19 September 1864. Born: 30 June 1842, Pittsburgh, Pa. Date Of Issue: 19 May 1899.
drove the enemy out of his works, and captured many prisoners. August 18, 1862, Lieut. James M. Schoonmaker, of the 1st Maryland Cavalry, but a citizen of Pittsburgh, Pennsylvania, was authorized by Secretary of War Stanton and Gov. Curtin to recruit a battalion of cavalry of five companies. Recruits came in so rapidly that on the 29th the authority was extended to the recruiting of a full regiment of twelve companies. The companies were composed chiefly of men from Allegheny, Armstrong, Butler, Erie, Fayette, Lawrence, Washington and Warren counties. Companies K and L were principally, and Company M entirely, composed of Armstrong men, and for that reason, a brief outline of the history of the regiment is here inserted. The regiment rendezvoused first at Camp Howe and subsequently at Camp Montgomery, near Pittsburgh, where, on November 24, organization was effected, with the following officers: colonel, James M. Schoonmaker; lieutenant colonel, William Blakeley; majors, Thomas Gibson, Shadrach Foley and John M. Daily. On the same day, the regiment moved toward Hagerstown, Maryland, and from thence to Harper's Ferry, where it remained on picket duty, varied with an occasional skirmish with the guerrilla bands which infested that region, until May, 1863, when it was sent to Grafton, on the Baltimore & Ohio Railroad, and attached to the mounted command of Gen. Averill. The service at this time consisted in holding the towns of Beverly, Phillipi and Webster against a body of the enemy's cavalry. 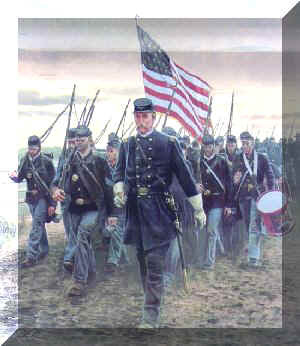 The 14th was held at Phillipi, and the remainder of the command at Webster and Beverly. The force at the latter place was surrounded by a brigade of the enemy. The 14th marched to their relief, and after a toilsome march reached the town early in the morning. A short skirmish took place and the enemy was compelled to withdraw. After this time, Gen. Averill's command was engaged on the Upper Potomac during the Gettysburg campaign; also at the Greenbrier White Sulphur Springs, where the 14th distinguished itself by repulsing three determined charges of the enemy. It was in the Droop Mountain raid and some smaller engagements. At Craig's creek, where Gen. Averill and his command seemed doomed to certain capture, he skillfully eluded the enemy, and no less than seven times in twenty-four hours the artillery was dragged by hand through the creek, which was deep and filled with floating ice. In November 1863, the 14th by the destruction of the bridge over the Jackson river was cut off from the main troops, and Gen. Early sent in a flag of truce demanding its surrender. Although surrounded by adverse circumstances, the men of the 14th reg. were not the kind to weakly yield, but setting fire to the train and fording the river, they made their escape and rejoined the command, which swam the Greenbrier that same night, crossed the Alleghenies by an old bridle-path, and, finally, after a march of five days over almost impassable roads, where the men were compelled to walk, reached Beverly. From this point, the command went to Martinsburg and into winter quarters. In recognition of the great service, which the command had performed, the War Department gave to each man a new suit of clothes as a gift from the government, the only instance of the kind during the war. The command was engaged on picket duty all of that winter, and arduous duty it was, too. In the spring of 1864, Gen. Averill's command undertook a movement through Virginia, which was successfully accomplished after great difficulty. While on this march, the soldiers of the 14th, on one occasion, were without food for five days, and many died from hunger. The last portion of the service in which this regiment was engaged included the battle of Moorefield and those brilliant engagements under Sheridan, which have made his name famous. April 20, 1865, the regiment went to Washington, D. C., and on June 11, to Fort Leavenworth, Kansas, where it was consolidated into a battalion of six companies. The date of the muster out was August 24, 1865, and the companies returned in a body to Pittsburgh, where they disbanded. During all the campaigns in which it was engaged, the 159th lost about eighty men killed and more than 200 wounded, besides many reported missing. J. M. Schoonmaker was promoted from Second to First Lieutenant Jan. 14, 1864; to Captain Jan. 28, 1865. Photographs Of J.M. Schoonmaker can be seen in The Soldiers & Sailors Memorial Hall, Oakland section of Pittsburgh. 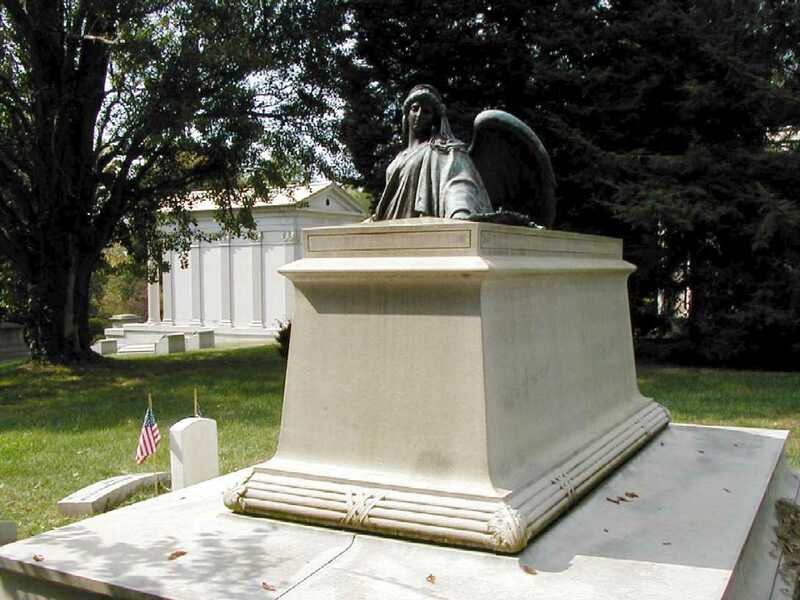 He was a prominent railroad businessman, partnered with Andrew Carnegie and was a Commander of The Davis Star Camp - Sons Of The Union Veterans. 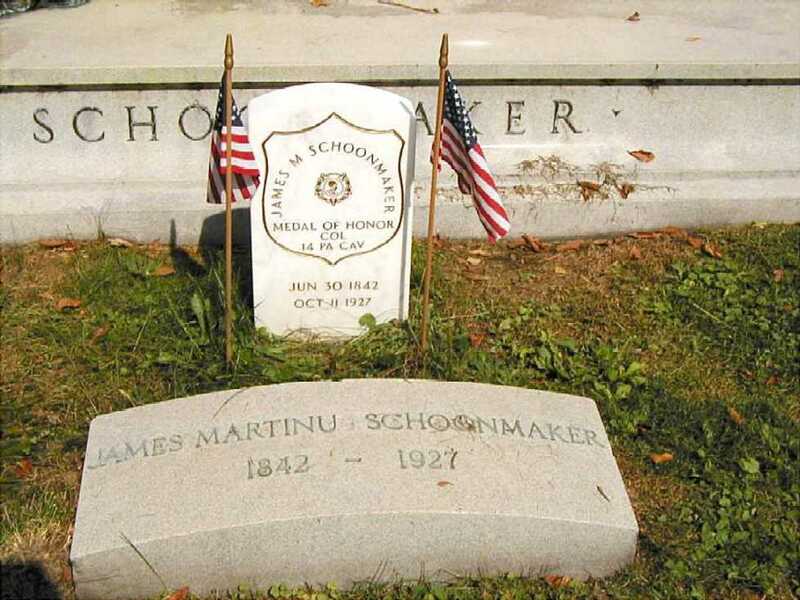 James Schoonmaker was born 30 June 1842 in Peebles Township (Allegheny County) PA. Schoonmaker was of New York "Knickerbocker" stock, his paternal ancestors having been born in Ulster and Orange counties, New York, subsequent to 1660. Schoonmaker was educated in Pittsburg private and public schools. He left Western University (now The University of Pittsburgh) at age 19 to enter the Army on 15 August 1861. Schoonmaker initially served in the Captain Robert Patterson Company, First Pennsylvania Calvary, which joined the Army of the Potomac. During the first year of duty, he was made Lieutenant in Company A, First Maryland Calvary Regiment, to which the First Pennsylvania was attatched. In August 1862 Schoonmaker was ordered back to Pittsburg to take command of the 14th Pennsylvania Calvary. He achieved the rank of Colonel in November 1862. Being 20 years, 5 months of age, Schoonmaker was believed to be the youngest Colonel in the Army. On 1 January 1864, Colonel Schoonmaker assumed command of the First Brigade, First Averill's Calvary Division, Army of the Shenandoah, under General Philip Sheridan. At Winchester Virginia, on 19 September 1864, Schoonmaker led a charge on Star Fort and.... 'at a critical period, gallantly led a calvary charge against the left of the enemy's line of battle, drove the enemy out of his works, and captured many prisoners.' A painting 'Calvary Charge of Colonel Schoonmaker' by Thor Thulstrup, hangs in Soldier's and Sailor's Memorial Hall. Schoonmaker's Medal of Honor was issued 19 May 1899. Following the Civil War, the War Department assigned the First Brigade to guard the Overland Stage Route from the Missouri River to the Rocky Mountains. The Brigade served until 31 July 1865, then was mustered out of service at Fort Leavenworth, Kansas. Schoonmaker returned to Pittsburg and entered business with his father. In 1872 he went into coal mining and coke manufacturing with his father-in-law, William H. Brown. Their company controlled more than 1,400 coke ovens in Fayette and Westmoreland (PA) counties. Company offices were located at 120 Water Street, Pittsburg. 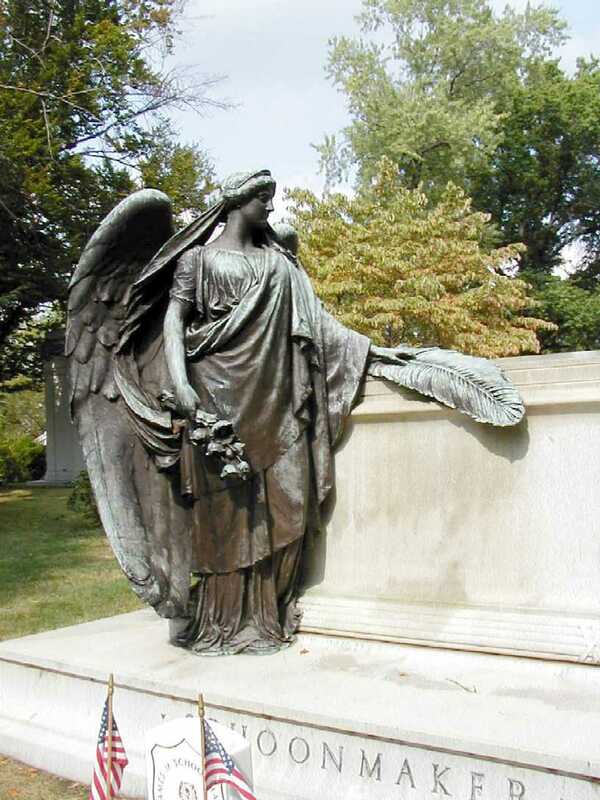 Schoonmaker sold his coke interests to the Henry C. Frick Coke Company (Schoonmaker's Family plot and monument are located next to the Henry C. Frick Family plot in Homewood Cemetery. (Comment-JTMcA)). Schoonmaker became one of the founders of the Pittsburgh & Lake Erie Railroad (P&LE). 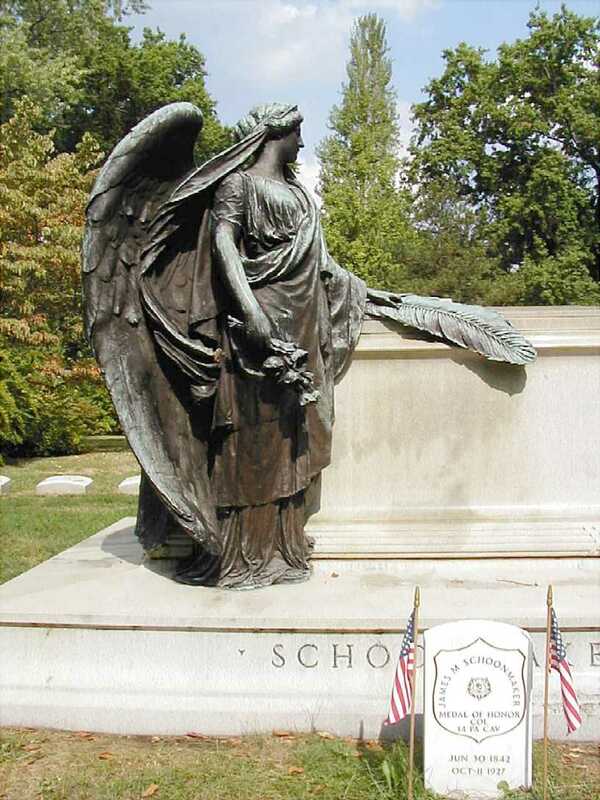 At the time of his death, Schoonmaker had advanced to P&LE Board Of Directors Chairman. Schoonmaker married Alice W. Brown on 22 February 1872. She died 7 October 1880. He then married Robekah, (Rebekah on her tombstone ~ (Comment-JTMcA)), Cook of Cincinnati, Ohio, 29 April 1886. They resided at 4940 Ellsworth Avenue, Pittsburg. Schoonmaker served as Vice President of the Tradesmen's National Bank, Vice President of the Union Trust Company, and Director of Mellon National Bank and Union Savings Bank. For many years he was President of the Pennsylvania Association For The Blind. 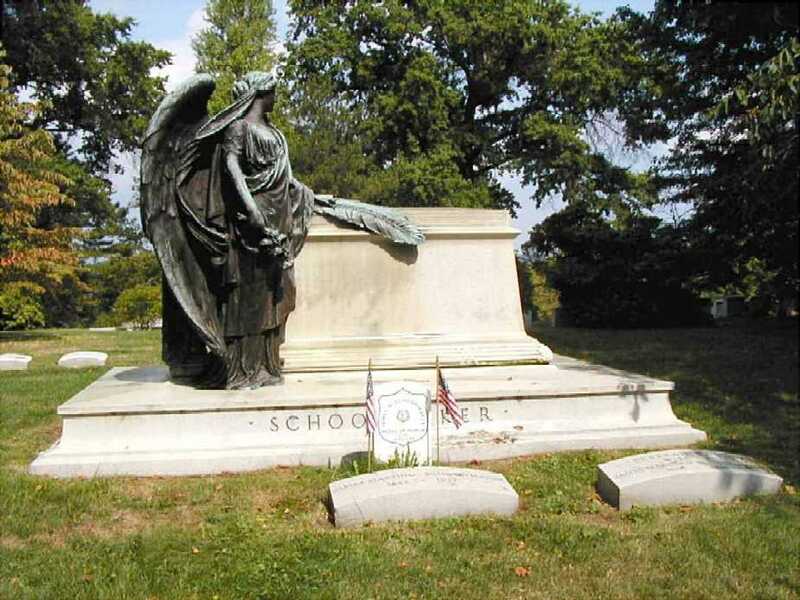 James Schoonmaker died 11 October 1927 in Allegheny General Hospital (Pittsburgh) following an appendicitis operation. Colonel James M. Schoonmaker Lot. Honorary pallbearers at Schoonmaker's funeral included: Howard Heinz (founder of H.J. Heinz Company): Richard B. and William M. Mellon; Taylor Allderdice: and John L. Porter. Colonel Schoonmaker is not buried in the above ground crypt. He is buried next to his wife Rebekah (Rebecca) Cook.